....or can anyone else see the evil one in this photo? It was taken inside an air raid shelter underneath Bidston Hill on the Wirral, by the time it was finished the war was nearly over...in fact it was never finished to the intended size ( to take 2500+ people) Left to rot after the war (although steel blast-proof doors were fitted for use in the Cold War period, the guys @ Wirral Wickie found a way in through a poorly sealed entrance and set about investigating the history of it, together with all of its secret and cunnigly concealed entrances, it took them around 18 months to get in and investigate it all. 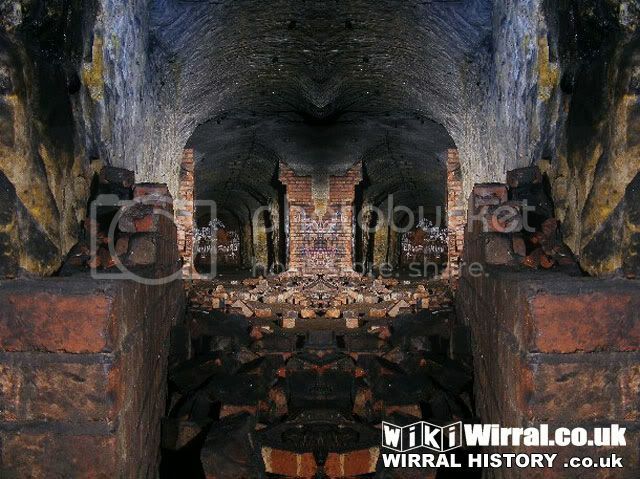 In the '50s the local police chief wrote to the Birkenhead council asking for the tunnels to be sealed off because of the drain on his resources in trying to keep the vandals out. By that time all the fixtures and fittings had been robbed/smashed and he considered it too dngerous to be left open. Look at the bricks/rocks nearest the camera, there is no way to get brick or rock that symetrical. Both sides of the centre line are identical so one is a reverse image of the other! hehe, yeah I have agree with Tintin. But still looks a cool place, I hang around on a 'urban explorer' forum sometimes where they take some fantasically creepy or just cool pics of inside abandoned buildings and other places. Went to Chisilhurst caves near Bromley a few weeks ago with the Mrs...she had not been before and loved it. A great day out for only £5.00.